I've been kind of MIA lately because of my job and the bad weather, however before Black Friday starts I wanted to share an outfit. Now, who said you can't wear pastel details in autumn-winter? Though the colours of the skirt are usually considered summery, paired with dark colours and boots it looks more autumnal. They help brighten the outfit. 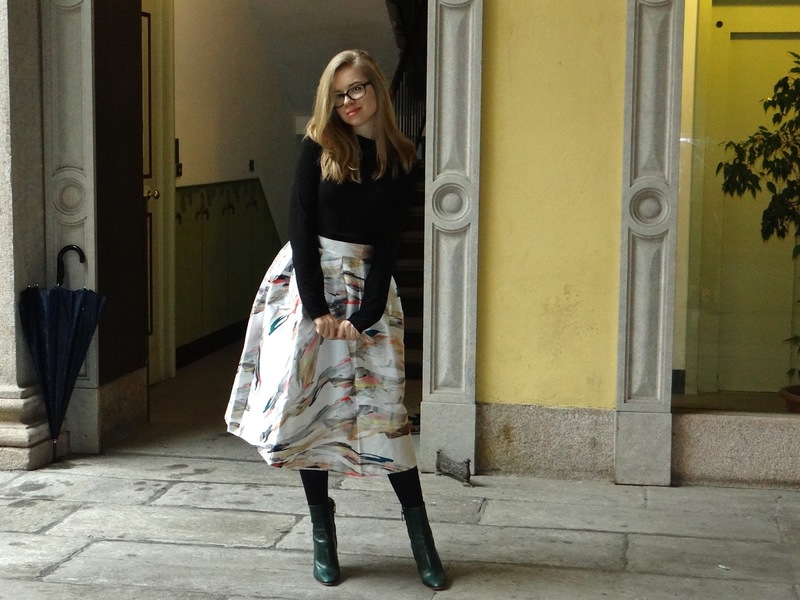 As you can see the whole look revolves around this artsy skirt, which I paired with green boots and a black turtleneck. When Romwe contacted me for a collaboration, I was excited to search for a cute item to style and this skirt was exactly what was missing from my wardrobe. They are also having a Black Friday Sale with up to 80% off and Cyber Monday Sale with buy one get one 90% off. Did that peak your curiosity? Just click on the highlighted texts. This skirt is something the most beautiful and fashion what I ever seen. It's so glamour. I love your shoes! This skirt is just amazing! Being busy is good, especially at the job! 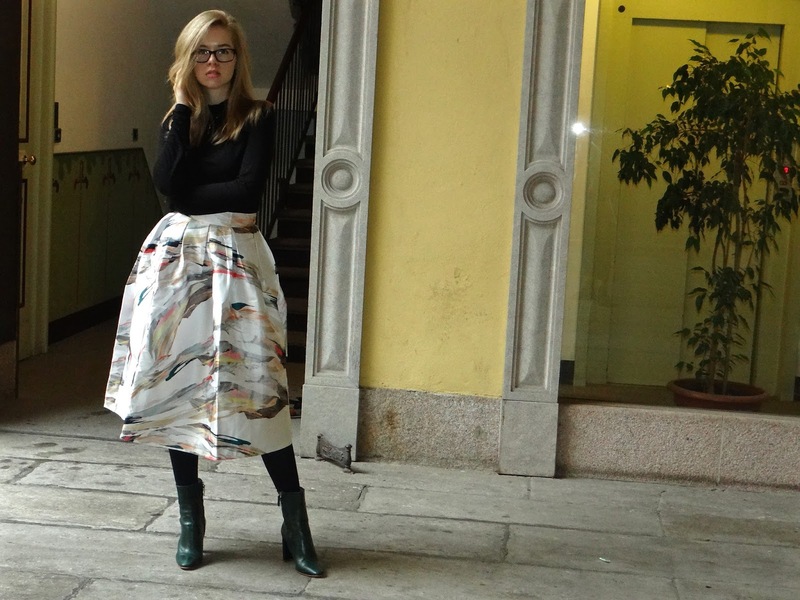 So don't worry, we can wait, and to see this beautiful skirt, what for a great print! Loved the outfit, very chic, you look very beautiful! I hope you have a nice weekend! This skirt is very different, it looks good on you! This is soo beautiful. It really suits you too. . . .
Oh very cute style darling! Cute skirt! What a beautiful skirt! I really like the print and it's so nice with all of the black :) There are so many great sales on at the moment for black friday. I love statement skirts like that! It looks absolutely stunning, gorgeous <3 I completely understand the reason for your absence - it's not easy to juggle everything. Take your time and ease into it until you find that perfect balance :) I am still in a search for it like it's a magical unicorn lol. Kiss and have a happy weekend! 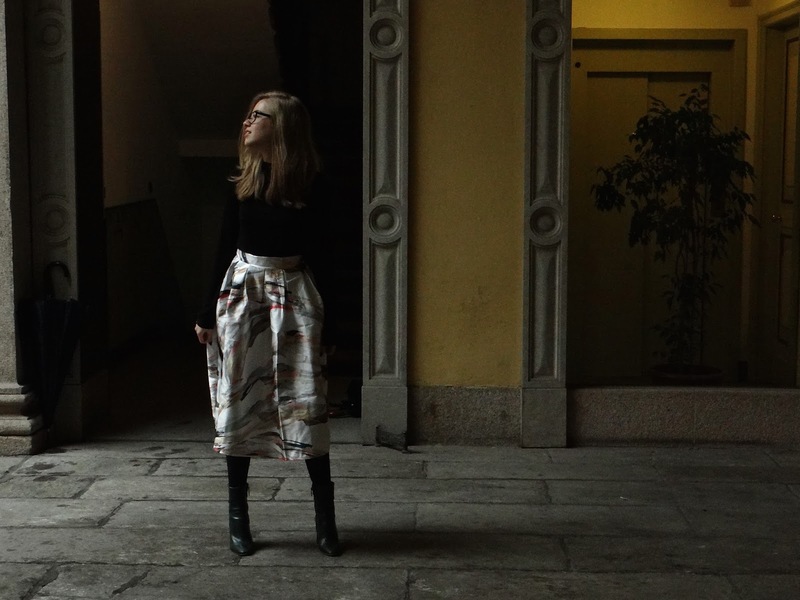 This skirt is gorgeous, particularly during these cold and dark months when we see so little color. What a beautiful way to add a bit of color to your life! Interesting autfit. And the skirt is very beautiful! gorgeous skirt, it's so elegant! I love that skirt and those boots. This skirt is so beautiful!! I love the color, print and shape of it.